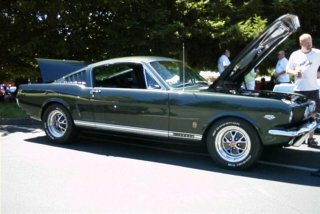 The sections below include lots of Classic Mustang information, for Ford Mustang Enthusiasts, Car Collectors and Restorers. You'll find handy Ford Mustang links to special editions, such as the first GT, California Special, GT350, fastback, convertible and many more. There's also a wealth of detailed restoration information and more, on each individual model's pages. plus performance parts comparisons and great technical information on the original and still classic Mustang. The Classic Mustang is Born ! April 17, 1964 was the day the automotive world changed. Ford Vice President, Lee Iacocca’s vision of the future for a new sports car, that seated 4 people, had bucket seats, a floor mounted shifter, and weighed less than 2,500 lbs was born. That day, over 22,000 new Ford Mustang cars flew off the showroom floors. The quick rush to market (from approval to production) necessitated that many off the shelf parts, particularly from the Ford Falcon were used. (Iacocca followers will note that he did the same thing at Chrysler in the 80’s with the ugly, but company saving K-Car), not to be confused with the highly sought after K code Mustangs. Before the very first Mustang hit the showroom floors, there were concept vehicles, created to get design ideas off the paper and into real life. Auto manufacturers used these concept vehicles to gauge the public reaction to the concept and help make decisions such as whether or not to produce the vehicle, as well as which parts of the cars they liked and which parts still needed improvement. Check out the following link in blue to see the full article on the Mustang History and pictures of the concept cars that led up to the biggest model introduction ever. What's your Favorite Model Mustang ? For much more detailed information about your favorite year click the blue links in each year's listing descriptions. 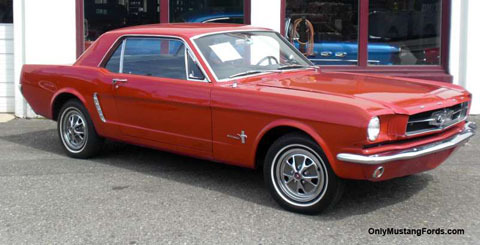 These first classic Mustang 1964 ½ cars are by model year, simply a 1965 Mustang. 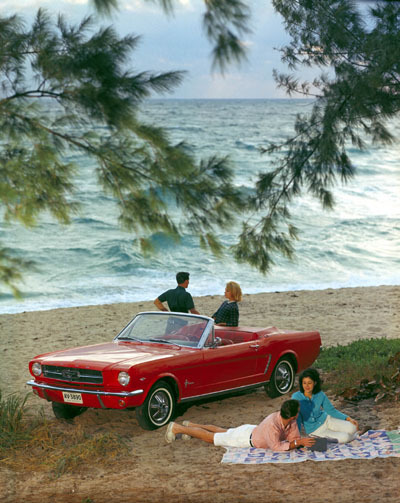 Yet this was the birth of the iconic pony car coupe and the forever popular Mustang convertible. The standard inline 6 cylinder motor and 260 v8 engine cars were covered by a 24 month , 24,000 mile warranty, and the new 289 4V (4 barrel carburetor) High Performance engine was covered for 90 days and only 4,000 miles, according to my owners manual! Later 1965 models of the now classic had several changes during production, including the elimination of the 260 v8 and its replacement with a new 289 V8 two barrel motor. 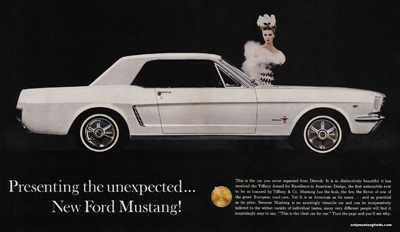 If you've been wondering how to tell the difference between a 1964 1/2 and a 1965 model, you'll find what to look for in the first section above and in the following link for the full Ford Mustang for 1965 story. Probably the next biggest arrival next to the incredibly successful introduction in 1964 of the Ford Mustang was the appearance of a new high performance version of the 1965 Mustang fastback created by Cobra legend Carroll Shelby. It's purpose was to erase any suggestion that this new smaller, nimbler car was only for women and those not up to the task of the bigger high performance cars offered to North American car enthusiasts. Not only was it an immense improvement in terms of performance, but it caused ripples in the entire concept of a muscle car. 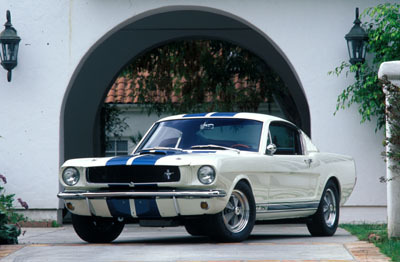 Here's the link to the full story of the 1965 Shelby GT350 Mustang. Looking for 1965 paint codes? Here's the direct link to the 1965 Mustang paint codes and colors. The 1966 model year brought changes in the sheet metal, including, grille, trim, gauges, interior panels, engine choices and options, as well as modifications to both front and rear valances, chrome trim and other areas. Follow the link for the full details, pictures and specific changes made for the 1966 Mustang model year. For in depth information on 1966 Mustang color codes, pictures of the OEM colors and other data plate information, check out the 1966 Mustang paint colors section. 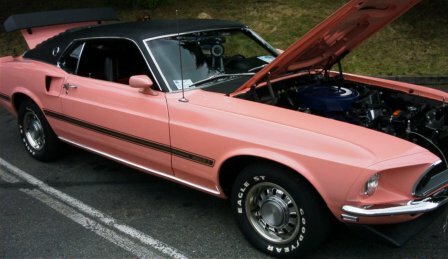 For 1967, Ford’s changes in the classic Mustang formula included new engine choices, more changes to styling and body panels, plus the addition of another 289 engine, including a special automatic transmission option for the 271 HP high performance engine known by many enthusiasts by it's data plate code as a K code. These engines were not only the most powerful and high revving of all of the 289 engines, but were the base for some hot-rod tuning and enhancements including a high rise intake manifold and the now famous and nearly iconic tri-Y headers by Carroll Shelby which boosted the K code engine's performance even further, reaching 306 horsepower. Click the link for more complete details, pictures and specifications on the 1967 Mustang . Whether you are in the process of restoring a classic 1967 Mustang fastback and looking at a color change, or trying to figure out what color your car should have been when it left the production line, check out the link here to take you directly to the 1967 Mustang colors and data plate information. Ford fans know that FoMoCo likes to update its models in 3 year segments and as expected, the now classic Mustang for 1968 that was introduced included the addition of several major and many minor changes. The body dimensions outside increased, not only to update the classic look of the car to a more aggressive stance, but also to allow the enlargement of the engine bay to accommodate the newest high performance engine. And in an effort to combat criticisms that Ford's classic Mustang muscle car or pony car was falling behind Chevrolet with it’s big block 396 Camaro, a new big block 427 v8 producing a conservative 390 horsepower and another even bigger big block with 428 cubic inches, called the Cobra Jet which was, said to rate only 335 hp, probably for insurance and licensing issues, but was in fact well over 400 hp in stock trim! Complete specs and information on the 1968 Mustang. Find detailed 1968 Mustang parts information. 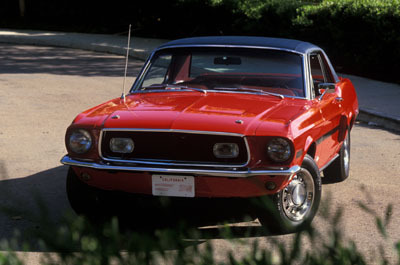 The 1969 Mustang again showed evolutionary style changes to its classic shape, and included revised sheet metal, with smoother sleeker sides, outboard high beam headlights and size increased to 187.4 inches. Interior changes were substantial The base v8’s were replaced with new engines sporting 351 cubic inches in both 2 and 4 barrel configurations. The big block motors now included the 390, the 428 and the 428 Cobra Jet. Here is more detailed information for the 1969 Mustang. In 1970, changes were made to the sheet metal, changing and refining that classic silhouette that is recognized world wide. 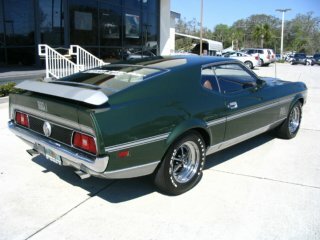 Engine choices had grown to nine, including special engine and trim packages, including some of the most popular classic cars to date, the Boss 302, the Boss 429 and the Mach 1. Here's more detailed information for the 1970 Mustang. 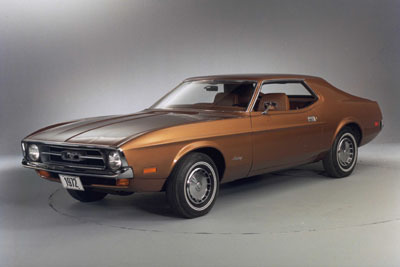 The year 1971 brought sweeping changes to Ford’s classic Mustang, not all of which were welcomed. The car grew in size and weight. The car was only slightly longer than the 1970, at 187.5 inches, but its new body style made it look even bigger. Both previous Boss motors were dropped and a new Boss 351 was added. One of the cooler features on these classic muscle cars, were the large scoops on the hoods of the Mach one’s, along with color keyed rubber bumpers, replacing the chrome standard pieces. Even more detailed information for the 1971 Mustang. For 1972, few changes were made. Power for the small block v8’s was actually similar to the 1972 cars, but changes in ratings made the posted numbers look even more dismal. 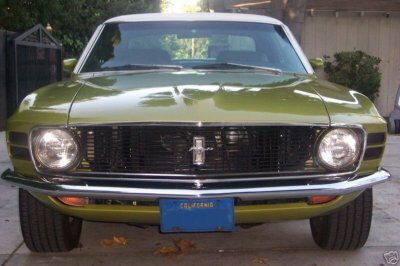 The 1973 model year brought some minor styling changes and brought a slight increase in sales. It also spelled the end to the classic Mustang shape. New safety regulations spelled the coming demise to the convertible and this was the last mustang to be available as a drop top until 1983. 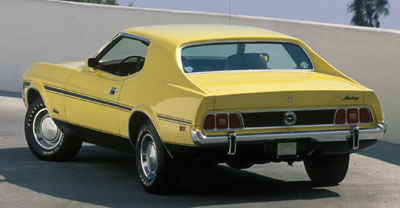 Trim changes included color keyed rubber bumpers from the mach 1 and changes in parking and running lights. Specs and other information for the 1973 Mustang .